Today it's just called the Marconi Station World Heritage Site. The above image shows the Marconi transmitter during construction in Bolinas, CA. He had begun experimenting with radio in 1894. In 1909 he had won the Nobel prize in physics. By 1912, he had acquired either built or acquired 70 land-based radio stations. One of these was KPH, the first radio station serving San Francisco, CA. More here. In that image you can see the lines from bulldozers in the dirt radiating outward over the ground system that connects to a metal plate in a nearby stream bed. Zinc plates were buried under each corner of the building. Lines behind the structure are fill dirt over more ground wires that run over the bluff to a massive plate in the ocean. To the the east they extended under the transmitting antenna. Like other Marconi designs the transmitter had nine 300 foot masts radiating a signal from a 230kW rotary spark gap transmitter. At Bolinas was the transmitting station. The receiving station KPH was about twenty miles further north in the town of Marshall, at Point Reyes. More here. Lettergrams $1 for the first 12 words, each additional word 8 cents. Weekend letters $1 for the first 24 words, each additional word 6 cents. The station only communicates with Koko Head T.H. But in 1916 KPH wasn't yet in Bolinas. That construction was not complete. When Marconi bought KPH from DeForest, it was still operating from a hotel in San Francisco. It began operations at the Palace Hotel, but was forced out by the 1906 earthquake. It moved to Green Street, then Hillcrest in Daily City... series of temporary homes. But in Bolinas and Point Reyes it had found a new permanent home from which it woudl broadcast for another 80 years. During WWI Marconi lost KPH. The US government seized control over all radio communications. 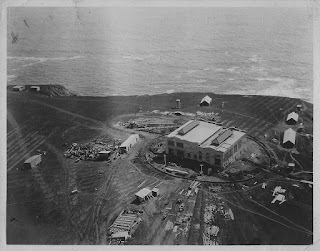 In 1919 the US Navy seized the Bolinas site. Despite his fame, Marconi was an Italian fascist, and an apologist for Mussolini. He joined Mussolini's Fascist party in 1923, and later joined their grand council. Mussolini was actually Marconi's best man at his second wedding. No exception could be made, not even for the man popularly believed to have invented radio. Radio Corporation of America (RCA) was formed which bought the holdings of the American Marconi Company. RCA then sold the majority of undeveloped land around the site, retaining only 62.7 acres surrounding the station buildings. The national park service currently manages the property. In 2014 the Point Reyes, Marshall, and Bolinas area celebrated the centennial of the Marconi station with KWMR and the Cornish Amateur Radio Club. IT was quite an event. More here.